This week I travelled to Singapore and back on business. Singapore is an interesting and vibrant place and the vibrancy was piqued by the preparation for Chinese New Year. There was a strong contradiction between the modernity of Asia’s finance industry and the preparation for a traditional time of celebration. One of the challenges of business travel is the dislocation I feel. Not only am I away from home and unfamiliar with my surroundings but there is also the time difference to contend with which brings with it the joys of jet lag. Despite my efforts at self-medication I was often awake at an ungodly hour of the morning. To accompany me I had Do DeLillo’s recent book Zero K which tells the story of a dysfunctional father and son relationship and impending cryogenic freezing of the father’s second wife who is dying. DeLillo writes in quite a stark manner and the subject matter added to the apocalyptic sense of this novel. In the wee hours, struggling from a lack of sleep I would read a chapter and then look out of my hotel room window at this curious city. I was living my own dystopian dream and, apart from the inevitable tiredness during the day, I was revelling in each moment. I touched down in Heathrow at the end of my visit to a typical London winter. It was 5am, the temperature was close to freezing and the trip across the M25 was an adventure in its own, being as it was through reduced visibility and driving rain. After negotiating with the BA staff at Gatwick I was moved to the earlier flight home to Jersey and eventually back into the arms of normality (at least in accordance with my standards). This morning I woke shortly after 2:30am in a state of confusion. For the first semi-conscious seconds I was unable to remember exactly where in the world I was and what time of the day or night it was. Singapore now seems like a dream, a shifting memory that is slowly dimming and disappearing into a small number of disconnected fragments: the colourful taxis, the clinical buildings and the warm night air. Such is the nature of life. Each moment passes and is quickly condensed into a memory. Some last a lifetime, some disappear immediately and there are those that we amplify and embellish in the hope that they endure and provide a refuge in times of doubt and worry. Winter continues – Spring is coming. I spent this afternoon on a favourite stretch of coastline at high tide. It has been a fairly dank day and there were not many people around. I enjoy these conditions so long as I can stay relatively warm and dry. It is quite nice to spend time watching the rain (or drizzle as it was today) and the tide coming in. Occasionally, through the gloom a ray of sunlight would pierce the clouds and the surface of the sea would glow for a few seconds. Then the light would fade as more clouds rolled in. By the time I decided to leave I had taken quite a few photographs. The conditions were constantly changing as was the scene before me. Normally I only take a small number of photographs but today I was quite happy to let loose. Over the last week or so I have noticed the light hanging on the evenings a little longer. Of course we are now more than a month down the road from the Winter solstice and the days are slowly stretching. One of the things I love most about being a photographer is being outdoors. I believe I have become more tuned in to the seasons and gradual changes in temperature and light as we move between different times of the year. I love winter with its moody conditions but then I can find a reason to love any time of year, provided I have a camera in my hand. I have been reading the news about the freezing conditions some parts of the United States have been experiencing over the last few weeks. Really cold weather appeals to me on some level. I often think that I would like to experience it for a few days just to see how cold it actually feels. Although parts of the US have been cold there is really no comparison to the town of Oymyakon in Siberia where the public thermometer (installed as a tourist attraction) reached -62C before giving up the ghost! I have pictures of people with their eyelashes frozen and apparently your breath can look as thick as cigar smoke. I often wonder why people continue to chose to live in a place like that. In Moscow this December only 6 minutes of sunshine were recorded making it the darkest December on record. This morning I seen photographs of the streets of Paris under water as the Seine has burst its banks. At the other extreme, parts of southern Australia are experiencing temperatures well into the 40s with a week of those conditions to follow and health warnings being issued. I'm not a huge fan of extremely warm conditions as it can be impossible to escape. So I will take our dank January days. At the same time I am looking forward to the Spring and the gentle warming of the air temperature that we will start to experience. I like the feeling of anticipation that you experience when you know that positive change is coming. Before you know it we will be through the Spring Equinox and Summer will be upon us. Sometimes you think that things will never change. I read a blog this week of a girl in her mid 20s who was dying from cancer. She spoke about her unfulfilled dreams but also about how she was making the most of every moment of her life. From what I can recollect she died early in the New Year and her family released some of her words in tribute. When you are a kid you take the way the world is for granted. I remember being out for a walk with my mum when I was about 11 years old. She told me that one of my childhood friends was facing the prospect of losing a parent to terminal illness. At the age of 11 that is pretty difficult to understand - not only in terms of the death of a parent but also the thought of facing the rest of your childhood with the loss and the grief. Everyone has troubled times in their lives. My wonderful wife lost her father at a very young age and while I have no doubt that it was a heavy burden to carry I can also say that she is very strong, resilient and resourceful because she had to deal with that experience. I was reminded of these things this week. One of my favourite places to photograph is a nondescript field along the coast. Two trees stand on the edge of it and they look as if they were meant to be together as their branches reach out and touch each other. When I first visited this location I thought to myself that they looked like a father and a son. This was particularly poignant for me as I lost my own father 10 years ago this year and I often thought of him when I visited this place. I have become very used to seeing these trees together and spending the time thinking about my dad. It has become a special place for me. The stormy weather over the last few weeks has changed all of that. Two friends separately got in touch to say that the smaller of the two trees has been damaged by the strong winds. This afternoon I decided to visit to see for myself what had happened. I was quite saddened when I got there. Now I do not wish to trivialise the death of a parent or a young girl and compare it to the snapping of some branches. The message is more around emotion and sentimentality and association and how we cope with loss. Life can be very brutal and Mother Nature can be very uncaring. We live in a world that can be very unfair. Between Christmas and New Year I spent a lot of time with my family but I was also thinking about those who do not have families close by. I think about elderly folk who live on their own. I worry about children whose parents do not or can not care for them. My heart goes out to those who are approaching the end of their lives and those that they leave behind. So you see that things do change. Even though you may go from one day to the next thinking that all will stay the same you may find that it doesn't. Although this may be quite a sombre post it is worth remembering that there are amazing happy moments in life. Things do not always change for the worse - sometimes they change for the better. However, do not waste your time on the unimportant things in life. Make the most of every day. Live life to the full. Dream a little and do not forget to put your arms around the ones you love. So it has been 6 months since I wrote my last blog. Time passes more quickly as each day goes by and before you know it winter is coming. Autumn and winter tend to be more creative times for me. The light is so much better, sunrise is at a more reasonable time and most (sane) folk are not that interested in a cold sunset. The solitude suits me well so I do not worry about being alone, on a beach, watching the last light of the day seep from the sky. Last week was spent in Singapore on business. I was astounded by the number of people taking photographs. I crossed the bridge to the Marina Bay Sands Hotel and I was convinced that everybody was taking a photograph. There were quite a few selfie sticks in evidence (yuck!) and even more DSLRs (or other digital cameras) and there was I with my Hasselblad. Alone in the crowd. I often wonder why there is a link between creativity and a slightly troubled mind. I think of Rothko and van Gogh and Kurt Cobain. Does one element feed the other? Rothko's work at the end revealed his mood. For me, it is probably the most beautiful period of his work but it can be painful to look at in that context. I'm not suggesting that I have a troubled mind but I often find that I seek solitude when photographing to remove all distractions. A bleak and melancholic landscape fills me with warmth and contentment. The beauty of nature is a truly powerful catharsis - a welcome escape from modern life. I'm hoping that the drawing in of the days and the changing weather translates into a period of creativity and that I write on a more regular basis. I suppose that this time of year brings out opposite emotions for me than those who bemoan the cold and the dark. For example, I see beauty in the naked trees. In a sense I feel pity for them as they bare their souls to the wind and the rain and to me. In the words of W B Yeats, a terrible beauty is born at this time of year. So forgive me a little for my yearning for winter. If you enjoy reading my blogs and looking at my photographs then it could well be a very positive time of year. If ever there was a photograph that summed up a moment in my life, this is it. I have left my job of 13 years for a new challenge. It was not an easy decision but it was the right decision. I have left behind many friends and a lot of certainty for an opportunity that I hope will stretch and reward me in equal measures. Sometimes in life it is good to embrace change. It is also good to test yourself and to see what you are really made of. It is all part of a lifelong education. So you see - the path ahead is slightly unclear. I know that that the further along it I walk, the clearer it will become. I also know that the past will slowly fade away behind me. That past is important as it took me to this place but if I stand still I won't find out what is just out of sight. This is a journey that I have to take. It has been a long time since I cared about how a photograph looks. I care much more about a photograph makes me feel. Now I am aware that the two things are related but bear with me on this. A few years ago I took what I described at the time as a technically perfect photograph. It was a photograph of some rocks in the sea. It was exposed correctly with no blacked out shadows or blown highlights. It had some nice points on interest along the rule of thirds line and it needed very few corrections in processing. The composition worked for me but then composition is a personal choice so I only have my own view to go on. Despite all of this the photograph left me a little cold. I felt that as a digital photographer I had nothing really left to learn. I knew my camera inside-out and could use it in the dark if necessary. The photograph in question was arguably one of the best that I had taken. The only way forward was to continue to hone the skills I had learned especially being able to see an image in a photographic way and to compose in a manner that made the viewer interested. But I realised that I needed to continue to learn new things. I wanted to continue to be inspired and to push the boundaries of what I could create. So I bought a film camera and the learning experience started all over again. This became a real challenge. I now understood that it was not simply a matter of transferring the technical knowledge I had from one medium to the other. A lot of that knowledge was important but I needed something more than knowledge. Of course, I was unbowed and persevered. Failure is a strong master. Failing at something that I was used to doing well was tough. The easy thing to do is to give up - and I did - for a while. The first thing that I did when I took a photograph with a digital camera was to look at the screen on the rear of my camera to see what I had taken. You can not do this with a film camera and it became clear that this was causing me to fail. It seems crazy but what I learned to do with my film cameras was to really take care of what I was seeing through the viewfinder when I was taking the photograph. I began to pay a lot more attention to what I was seeing through the viewfinder and in particular to how it made me feel. Occasionally, I would have a rush of excitement when I was particularly drawn to a scene in the viewfinder and that is when I realised the importance of the emotional reaction to my photographs. If I don't have an emotional reaction now I do not take the photograph. I'm sure there are lots of photographs that I miss, but I don't care. Another important turning point for me was in learning to embrace the imperfection of film. I used to strive for perfection and now I was embracing imperfection. Some of my digital photographs felt cold and clinical whereas my film photographs were organic and warm. This was enhanced once I started printing in the darkroom. I could work with a negative to produce a print in a way that appealed to me. There is an immense sense of contentment in producing a darkroom print that you are proud of. I worked on contrast and the tones of my prints to hide or reveal details in the photograph. I recalled the advice of great photographers who comment that it is not what is seen but what is unseen that is most important. Sometimes what is unseen is outside the frame of the photograph. Sometimes it lurks in the shadows. Sometimes it lies in the individual grains that collectively make the photograph but does not manifest itself into a physical representation in the image. In some way it lies just beneath the surface. A good photograph tells you a story. A great photograph only tells you part of the story. The rest is up to you. Because of all of this my photographs have become very personal reflections. I do not photograph things that I hope that other people like (although I am delighted when they do). I pour myself into a photograph and there is part of me in every single one of them. Now, technical excellence is irrelevant. What I strive for is emotion, some beautiful imperfection and a narrative that is personal both to me and, hopefully, to the viewer. When I was a child I used to have a dream that I was alone. What I mean is that I was the only person left on the Earth. I read a book borrowed from Bessbrook Library called Z for Zachariah (by Robert C O'Brien). The basic premise of the story is that a young girl has found herself alone in a post apocalyptic world. The valley she lives in has been sheltered from whatever catastrophe engulfed the rest of the world. Eventually, a stranger happens along and this girl decided that if Adam was the first man on the Earth then the last man should be named Zachariah. This book obviously had a resonance with me. I have read quite a bit of dystopian fiction and, in general, I find it wonderful escapism. Probably my favourite book of all time is the The Road by Cormac McCarthy. It works on a similar premise to Z for Zachariah but is definitely not childrens' fiction. I have often thought that if I only ever read one book in my existence then that would be the perfect one. Obviously, this sentiment has played on my conscience for many years. In addition to my childhood dreams of solitude I often imagine that I am alone on the Earth. Even as I sit here and type I consider the thought that this message will not be read by anyone other than me. I sometimes wonder whether memories are versions of reality or psychological comfort blankets that we store. I know this might sound slightly odd but that is how my brain works and it is one of those things that I have little control over. 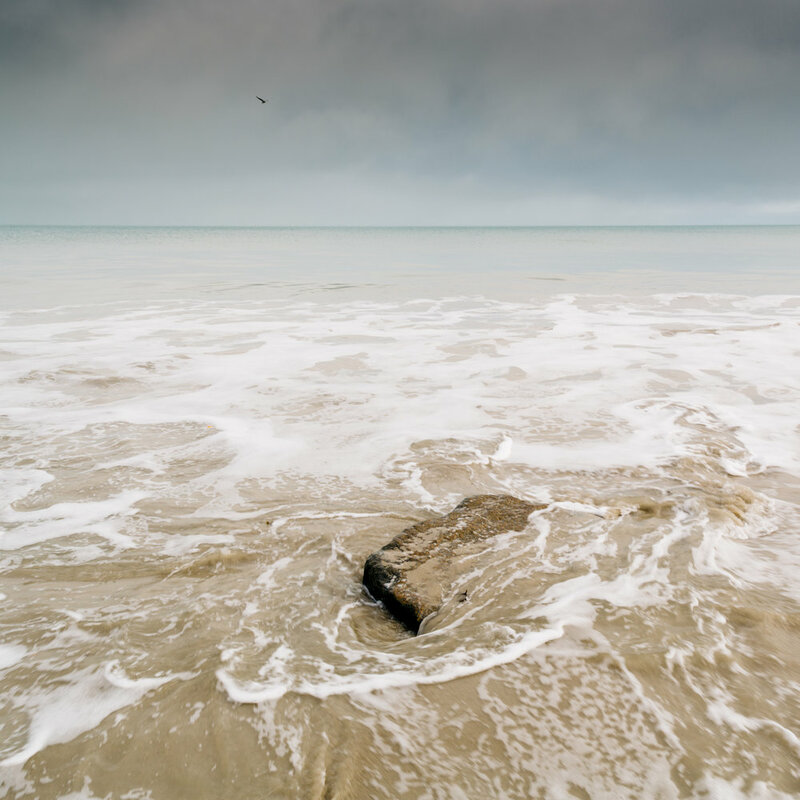 There is a sparseness about seascape photography that pulls strongly on my emotions. I find it very balanced and I gravitate towards the work of other seascape photographers. There is a beguiling beauty about a photograph with only 2 or 3 elements in them especially when those elements are the forces of nature. In addition, in many seascape photographs there are very few traces of man's presence. I do love to position an old pier against the movement of the sea to create contrast and interest but there is something ethereal about a scaleless vista that perhaps asks more questions than it answers. 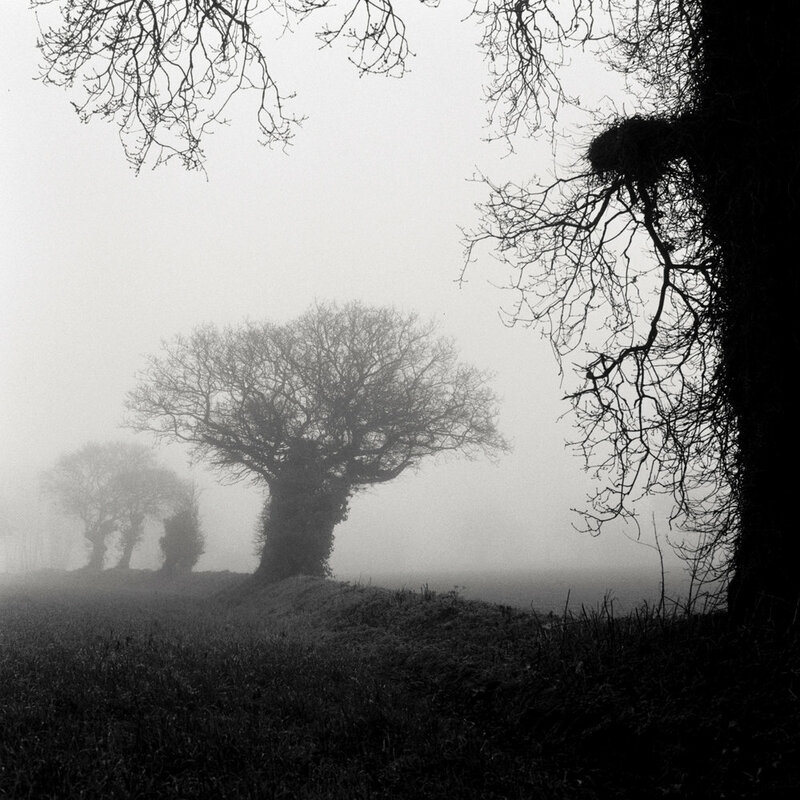 Michael Kenna often mentions what is 'unseen' in a photograph. He is more interested in suggestion rather then description. I understand that. We have so much information forced on to us on a daily basis that it becomes quite cathartic to view a photograph that tells us only part of the story. It is then down to the viewer to decide what the rest of that story should be. The photograph that accompanies my blog today wraps a lot of these emotions up in one image. The sea mist helped create a very ethereal moment. I had the sense of standing at the end of the Earth. I could only see as far as the mist would allow and I felt that there was nothing but the depths of space beyond my view. The sun was just strong enough to make it's way through the mist to illuminate the water and the sand and this added to the sense of isolation that I felt at this moment. It was a truly special morning. I have to finish by saying that loneliness and being alone are very different things in my world. Loneliness is an emotion that is characterised by a desire to be in the company of others. Being alone can be very peaceful. I am surrounded by wonderful people that I love and care for and I wouldn't change that for the world - even if my brain does wander off on occasions. My mind is restless at the moment. Last night I was standing washing prints having spent a few hours in the darkroom. Something unexpected happened. The solitude of a few hours with very little to concentrate on other than light and paper and chemicals is a welcome step away from normality. The music of Ludovico Einaudi floated in the air while I printed and the hours disappeared. It was close to 1am when I emerged into the harshness of the light in the kitchen. It was quite a good session. Darkroom printing is all about working with tones, with light and dark. Pushing negatives to give up their secrets. Sometimes they are welcoming and offer endless possibilities. Sometimes they are less compliant. It can be the most rewarding and the most frustrating time. So there I was, standing blinking in the hard electric light, my evening's prints in a tray under some cold water when I felt a breath on the back of my neck. The house was quiet apart from the hum of the lights and the splatter and gurgle of the running water. I turned around sharply expecting that my wife Valerie had wandered in to see what I was up to. I thought my heart was going to explode. I am not superstitious. In fact, I am quite sceptical (and some would say cynical). In the few minutes that followed I was rooted to the spot, afraid to make a noise. The logical part of my brain clicked into gear and I turned back to continue with my work. This time I ignored it and continued with my work. Shortly afterwards I went to bed and lay awake in the darkness, listening. I realised that I was holding my breath, expecting to hear another sign of an extra presence in the house. It was a long night. There is quite a bit of change in my life at the moment. There are things that I am unsure about and this is interesting as I generally have a lot of stability. Although I am unsure about the future, these changes are welcome and have been initiated by me. I need to stretch myself in my career and that means taking a step away from what I have known for many years. My son has changed school and that has changed our home routines. I have enjoyed these changes (and others that I won't mention) but they have made me restless. I suspect that the breath on the back of my neck is a message from my subconscious. I am trying to tell myself something, perhaps I am trying to remind myself that something needs doing and the business of life has pushed my priorities around. My father once told me a story about his mother. In her later years she lived on her own. One night she awoke to hear footsteps coming from the attic above her bedroom. She had forgotten to do something that she did every year and her opinion was that this was a reminder from a lost loved one. My grandmother found this 'message' comforting. I'm not sure that I find the same comfort. If it is something I have forgotten I really hope that I remember soon. In the dim and distant past I visited a shoe shop with my mother. I have no idea as to how long ago this was but I suspect I was about 4 or 5 years old at the time. The shoe shop was split into 2 levels separated by a staircase. The area on the ground floor was where shoes were sold. The area on the upper floor was where shoes were mended. I remember as a child being curious and slightly afraid of the noise that came from the upper floor down into the shop. The cobbler used a lathe of sorts that I seem to recall was operated using a footplate that he had to pump to make it spin. Even thinking about it now makes the hairs on the back of my neck stand up. One time I was in the shop, my mother was having a pair of shoes repaired and we went upstairs and into the noise to see the cobbler. I still remember seeing him, an old man wearing glasses and a brown leather apron with a hat like that of a croupier on his head, bent over the lathe working on a pair of shoes. The upstairs area was pretty dark and illuminated by a naked bulb hanging unceremoniously from the ceiling. The room was obviously a store and packed from floor to ceiling with shoeboxes. The smell of leather was everywhere. I held on tightly to my mother’s leg. The noise, the smell and the creeping darkness terrified me. The old man seemed to me to be ancient beyond compare. It was like stepping into the monster’s lair. If you got too close the monster might swallow you whole! I reminisce about this memory now. Being a child protected by your mother is a very warm and secure thought. It was an adventure for me and perhaps one of my oldest memories. All these years later, I still vividly recall this evening in the past and still view it from the perspective of a child. I wonder does my mother still remember that day. I suppose the reason why this memory seems to recur to me regularly is something to do with the mechanical process that the cobbler was performing. He was bringing years of experience and no small amount of talent together to mend something old or create something new in a fascinating setting. In a sense, it is very like the process of taking photographs using mechanical film cameras and printing from the negatives you have created in the darkroom. I have always been intrigued by mechanical processes and manual crafts. It is quite special to have a talent that allows you to create using tried and trusted methods that have changed very little over many years. The craftsman puts something of himself or herself into the final piece. There will be some unique quirk that specifies that the piece of work is the product of a particular person. As our world becomes more automated and commoditised these quirks become more special and significant. Of course there will often be a small degree of imperfection in items that are produced using a combination of old mechanics and manual intervention. In my opinion, these imperfections are a major reason why these items become unique. This reminds me of collectibles, such as the limited run of banknotes that were found to have a spelling mistake or a particular classic car that was only built for a small group of the marques finest customers. With almost no reservation, any person can print a digital photograph that they have found online and it will be broadly the same as a print commissioned by the original photographer. Not so with darkroom printing. There is only one negative and therefore there is only one means of truly making an original photograph from that medium. I love this sense of craft, imperfection and uniqueness that comes from the cobbler’s wheel or from the photographer’s darkroom. A repaired pair of shoes will still maintain some characteristic of their owner. Perhaps the laces have been tied in a particular way and have made indentations on the shoe’s tongue or the heel has been worn more on one side due to the gait of the wearer. And so it is with printing. I like a vignette in my final prints and I haven’t quite mastered (I’m not sure that anybody does) all of the nuances of printing so I try to push each print a little further in terms of technique and expression. Next week I’m going to be brave – I’m taking my shoes to be resoled. Apparently this week we are going to experience a 'blast of Caribbean air' (why is it always a blast?) that will increase our temperatures to levels normally experienced in Spring. Reading this news got me thinking that we are moving towards the end of Winter and the beginning of a new season. Many people do not like Winter with its short days and colder weather but there is something very appealing to me about this time of year. I particularly like high pressure days in Winter when the air can be very cold and still. It feels as if the rotation of the earth has slowed and the gentle warmth of Spring gradually moves it along again. I love to walk in the woods amongst spectral trees that have shed their leaves and bared their souls to the world. Of course the trees, like many animals, are in a state of hibernation and preparation for the next cycle in their life. I feel it is a privilege to watch them as they sleep and sometimes gently stir when a breeze sighs through their boughs. Winter is also a time of regeneration. It is important for the circle of life to have this time of death and rebirth. It is very satisfying to watch the local potato growers go about their business, preparing the fields for the new crop. I love to watch as birds build their nests in preparation for their hatchlings. There is an anticipation for Spring and the new life in the fields with the birth of lambs and calves. Everything is being reborn. Except for the sea. She remains restless and eternal. The light at this time of year can be very beautiful. The Sun's low trajectory through the sky creates wonderful shadows and sunrise is at a more accessible time. Of course, there is an occasional frost and when the conditions are right (or wrong - depends on your opinion) blankets of fog over the land. Fog can be a nuisance if you are travelling and, when you live on an island the size of Jersey, it can create havoc on many fronts. So it is with a degree of trepidation that I admit to loving fog. On a cool Winter's day I feel it adds to that sense of stillness. It adds a degree of mystery to the world and everything takes on a subdued mood. For a black and white photographer, fog is quite wonderful. You see the structure and shape of objects rather than their colours. In a way, the world takes on a monochromatic appearance. Creatively, fog can be used to reveal or conceal elements of the composition. It can make you think about what is just out of sight - perfect!! One of the aspects of being a photographer that I am grateful for is this affinity to the natural world. I am always thinking about things such as light, weather and the tides. I have an appreciation of each season for what it brings but also love the changes to the landscape that we encounter as time passes. I enjoy being in the middle of a storm as much as I love the soft golden light of a warm summer sunrise. It is important to make the most of what we see around us and to enjoy it as best we can. I often think that the landscape doesn't ask much of us. It just 'is' and it is up to us what we do with it. I treasure my weekends. Time spent with my family is so important after the rush of a busy working week. In my job I am surrounded by people and have many interactions throughout the day. There are many things to do and meetings to attend, so it is wonderful that the pace of life slows at the weekend. Despite that, my weekends can be relatively busy too. I have three sons and a wonderful wife and there will always be things to do around the house and for the family. Home life is busy, but it is not stressful. I count the support and love of my family as the greatest gift I have. The time that I have in the landscape with my camera is a privilege. I feel a sense of freedom and enjoy some wonderful moments of peace. I have found that shooting film has enhanced that peacefulness. I tend not to worry too much about how my photographs will look. In the days that I shot digital landscapes I used to fret over the images I had taken and would spend time analysing the screen on the back of my camera to try to see the fault in my photographs. Many film photographers will talk about 'film slowing you down' and 'getting it right in camera'. That sounds fine to me but I don't really feel that way. I think the sentiment is that film photography is perhaps more of a craft than digital photograph which is perhaps more of an art. I'm sure there will be friends who disagree but that is how I categorise the two formats. When I take a photograph now I am generally in a place that I find beautiful. I work with old mechanical cameras. They tend to be the professional cameras of times gone by and that means they are beautifully engineered pieces of kit and aesthetically pleasing to behold. I tend to be on my own and I am using the creative side of my brain. Some of the places I go to are familiar and some are new. Either way, I wander around looking for something special that appeals to my eye. Sometimes, I can be away from home for hours. I am drawn to remote places: barely accessible parts of the coastline or the depths of the local woods are magically quiet and devoid of people. It is in these places that I find the photographs I have been searching for, moments of tranquility in an otherwise hectic life. So you see, photography is my catharsis. It helps to get me out of the house and away from the noise of modern life. I find the whole process to be the perfect antidote to a stressful life. On my way back home I begin to think of my wonderful family and the greeting I will get on my return. Everything about the journey to the destination and back is a joy and I cherish the whole process. After a tumultuous week I felt I needed some sanctuary. Jersey in winter can be bleak and, in the remoter areas, void of people. It is to these remoter areas that I go to looking for space and time. Although the temperatures recently have been quite harsh and biting there was no frost this morning. The rain was not far away though and as I write this I can see the rain through the window of my studio and hear it drumming on the roof. On these occasions I find myself looking for compositions of an intimate landscape. The world is full of beautiful grand vistas and iconic landmarks but they no longer seem to hold much of an attraction for me. I am more interested in the small details and so it was this morning. I was on familiar ground of course but after taking the obvious photograph I wanted to find something less obvious. And so I found myself climbing over rocks still wet from the retreating sea, desperately trying to keep my balance on their smooth, seaweed covered faces. Although there is a definite sense of isolation in such a place there is also an intense peace. I find that these experiences are almost spiritual in their essence. I often imagine that I am completely alone - the only person left on a distant and cold planet that is slowly spinning into its death throes. This sounds quite maudlin but I find it so beautiful. I have written about and contemplated the beauty of the sea many times. I understand completely those who are drawn to a lifetime on the ocean. Typically, winter seas are full of energy and that produces drama and tension. This morning's water was calm as it retreated gradually down the beach and away from me. There was an occasional rogue wave that caught my attention. Despite that it was very peaceful, the perfect antidote to a stressful week. Sometimes it is a combination of visual and aural experiences that lead me to a particular place. With the tones of Ólafur Arnalds in my ears I composed my photograph with a single sentry rock just off centre. The distant headland gave me a sense of scale and distance and the immediate foreground rocks provided a neat passageway for the sea to ebb and flow, drawing my eye through the scene. I had already contemplated a square crop for the final image (of course). I only then had to let light and nature work their collective magic. I've missed writing my blog over the last few months. I've often thought about my previous blog post and that evening when I sat with the windows open watching the light fade from the sky. There is no chance of that happening tonight. We are currently in the middle of a northern hemisphere winter. Snow has fallen across much of Europe and temperatures are plunging. Unfortunately, we have had no snow in Jersey and the opportunity to shoot a lone tree against a white blanketed backdrop has not happened (yet). Snow is my idea of minimalist heaven. I may need to travel to find some. So why have I been away? Life has been busy over the last few months. I continued the theme of 2016 in that I was constantly out in the landscape taking photographs. I had a number of articles to write and publish in various places, a lot of travel with work, two calendars to produce, an exhibition in China and a family to look after. Add to that Christmas, my beautiful wife's 40th birthday and my adorable son's 2nd birthday and it is no surprise that getting my thoughts straight was difficult, never mind getting them down on (metaphorical) paper. However, I love writing and I intend to do so much more in 2017 and beyond. Winter brings with it wonderful conditions for me to photograph in. Shorter days and the low latitude of the sun brings softer light. Weather conditions can be a challenge or an excuse. The opportunity to shoot spectral trees in fog does occur every now and then and it is often too good to miss. Stormy skies and seas are paradoxically very calming for my state of mind. We have had some high pressure weather systems with whispers of clouds and breathless evenings where the light just seems to seep out of the day. I think it is a wonderful time of the year. With all of the activity of the year I have begun to think about how I get my photographs out into the world. A website is great and social media is a very useful tool but there is nothing quite like the printed version. I have been encouraged to publish a book. It will be a very small print run and an intimate reflection of my work. I need to think about how I want it to look and feel but I have some ideas. The challenge for me will be marketing. I'm not great talking about myself and that will be something I may just need to overcome. Watch this space. My blog often starts out as a meandering thought that I transcribe onto the page or screen. I don't always set out to write something specifically but once the ink starts flowing or the keys start clicking the words just seem to spill out. Tonight I am looking through my negative archive at the photographs that I have taken with my film cameras and reminiscing a little. It is late summer and the weather has been great this week. I have some time off work and the stress has been melting away - it is a wonderful feeling. As usual, I am sitting in my studio with the lights off. The sun set about 30 minutes ago and I have been watching the sky change colour as I sit and contemplate. The windows are open and there is a soft breeze flowing into the room and around me. It is a perfect time to write my blog. At the moment I seem to be photographing constantly and as ever I am drawn to the sea. Earlier this week I spent time at a place that I have often found difficult to photograph. It is a place that I find the light quite awkward to work with. Having said that I do find it to be quite a beautiful place and time spent there is never wasted. With the great weather there were lots of people around. This place is a beach on the north coast of Jersey and it doesn't always get the most sunlight but people still visit as it is very beautiful. Of course, I was there as the light was starting to fade and within half an hour I was alone with the sea coming in and the darkness creeping. Time will tell whether I got any decent photographs but I did get an amazing sense of peace as I sat alone listening to the waves. Moments like this can be few - enjoy them. Although I love the sea I have been reminded this week about how unforgiving it can be. Around the UK a number of people have lost their lives at sea including one very close to home. While the sea is beautiful and wistful so it can be dangerous and dispassionate. Throughout my life I have known various instances of people who have been lost at sea. In Ireland I lived fairly close to some fishing communities. Occasionally there were stories of boats that didn't return and communities in mourning. These stories seemed to carry a deep sadness for me even if I had no connection to those affected. It seemed that the beauty and majesty of the sea added to the emotion I felt for the lives lost. I cannot explain it any more than that. In slightly more upbeat news, some of my photographs of the sea will shortly be exhibited in a gallery in China. This exhibition has been delayed a few times but when I sit back and think about it I am deeply humbled and immensely proud that my photographs will be hanging in a gallery, even if it is only for a month. I will post more details when I have them. And the title - well tonight I have been listening to Coldplay. I listen to a lot of music when I am working at my photography. It seems to be quite an eclectic mix to me - Pink Floyd, Radiohead, The National, Royksopp, Olafur Arnalds, Ludovico Einaudi and even (very occasionally) Moby. What I find interesting is the thought that the music I am listening to can have some sort of effect on the photograph I am taking or printing (when I am in the darkroom). It certainly influences the titles of my photographs. I recently spoke to a person who described themselves as a 'keen photographer'. Immediately they described themselves in this way I formed an opinion. It wan't favourable. Putting the word 'keen' into that description suggested a slightly nerdish quality to their relationship with photography. You know, the sort of person who thinks they are the resident expert and wants to talk in mechanical detail about why everybody else's photography is inferior to theirs. Good luck to them. My relationship with photography couldn't be further away from this. I like to be quiet about what I do. In a sense, photography gives me something to hide behind and I can see this in my photographs. They tend to be quiet observations of things that appeal to me. That is one of the reasons that I like black and white. It doesn't shout 'look at me! ', it just gets on with its business without fuss. As this conversation developed, I spoke about the photographers that I most admire. Inevitably I mentioned Michael Kenna whose photographs said photographer described as gloomy and cliched. I was intrigued. 'Why cliched? ', I asked. Apparently long exposure photographs are old hat and anybody could shoot them. I found this fascinating. When I initially set out to take photographs I always thought that long exposure work used a set of techniques that required a degree of skill that went beyond the normal. You need to understand your subject matter and your equipment in intimate detail. Once you add film into the mix with its complicating factors such as reciprocity failure then you were really testing the photographer's experience, knowledge and skill. "Cliched?" - I was indignant! I understand the sentiment in some way. I previously had a conversation with a professional commercial photographer who expressed his dislike for long exposure photography. My response was that the beauty of what we do allows room for people with different tastes, skills and motivations. A few days following this conversation I received a comment from him that although generally he didn't like long exposure he thought mine were pretty good. It was one of the finest compliments I feel I have ever received. Previously, I have discussed the use of the word melancholy to describe my photography. What is slightly surprising is that the music I listen to has that melancholy nature to it. I want my music to soothe me as I go about a long exposure or toning a print. I know that the music manifests itself in some way in the final photograph. With that in mind I have started to think about how differing influences translate into creative work. What would happen for example if I were to listen to Metallica or Kate Bush? What if I had watched a horror film the previous night? What photographs would I take after bad day at work? This is why I believe that try creativity is something that you pour all of your emotions into. Your work should be a statement about you. It is great to have influences and they help shape you but you should never just try to mimic others - what is the point? It takes time to find your own voice but it is time worth taking. In that way you will be very comfortable with the path you take. In case you were wondering - "I wish someone would take my place" comes from Heavenfaced by The National. It is the song that was playing when I started writing. As evidenced by my previous blog and its name I always intended to write a second part to my blog on France. I have been waiting on getting my negatives back from the films I shot there and they arrived late last week. Much of what I wrote previously focused on the changing political landscape in France and, boy! - have things changed since then, but enough about that. There is an amazing charm about France that I seem to have become enchanted by. Paris is a beautiful city. There is a nostalgic feel about it that seems odd to somebody who has only started visiting over the last 6 or 7 years. In a sense, I feel that I have known it my whole life and that each return is a homecoming of sorts. I don't know the city well at all so I cannot explain this sense of familiarity, nor do I believe it stems from the prevalent photographs of the city and its tourist attractions. It is something unknown to me. Outside of Paris, the French countryside is amazingly beautiful and I hope that I have more opportunities to explore and wander through that countryside as time goes by. Paris is the City of Light. What is interesting is that this name is attributed to a number of other cities in the world including Venice which also has a special place in my heart. My travels also take me to Geneva and although I haven't visited Switzerland as much as I would like, I do feel a resonance with what I have seen of it so far. All of these places are of course European and have considerable history attaching to them. You can feel that when you are there and I wonder how I would feel about other historical cities given the chance to travel to them. I have never been to Asia or the Americas although I have travelled to the Middle East and around other European countries. Many landscape photographers talk about Iceland as a 'must-do' jurisdiction but I have begun to wonder about this. I am constantly looking for something different to photograph and this is challenging. There is nothing new under the sun so how does one achieve this? What is the point in going to Iceland to stand in the same spot as thousands before you and take what will essentially be the same photograph? In the same vein - why take a camera to Paris and why take a photograph of the Eiffel Tower. When my earlier photograph of the Eiffel Tower circulated on social media it was commented on by a young and aspiring photographer who remarked that he would never think of taking a photograph of the Eiffel Tower from the angle that I took mine. He thought it was very clever and very beautiful (his words, not mine). In fact he had been in Paris over the last few months and returned with the same photographs as 'everybody else'. I understand the need to have a stock photograph of a famous landmark. I am guilty of this myself. Despite this, I am always looking for something slightly different and that is what I have encouraged this young chap to do. How will you ever get recognition for your work if it does not stand out from the crowd? This blog carries one piece of advice therefore: do something different. Look for something new. Use your inspirational guides to direct you along the path but do not be afraid to leave that path and search for something unique. Even in the City of Light you may find your own way. I often wonder what my father would have made of my photography. If he believed it was any good I’m sure he would have become my number one publicist. He had a tendency of treasuring things. Quite often he would advise us to keep things good or to ‘put things past’ as he described it. The things that he put past would sometimes make an appearance when visitors arrived at our house. My father would disappear and return with a smile and his ‘treasure’, which he would proudly regale all with stories about. After he had passed away I heard many stories of how he spoke about his family to people he worked with or encountered during his working day. There would be stories about our achievements and our lives and although these could be temporarily embarrassing to hear replayed, I was always very pleased that he wanted people to know he was proud of us. These anecdotes were also treasures that he kept stored, waiting for the right moment to unveil them and share them – immeasurably the proud parent. So it would have been with my photography. I’m sure I would have been hearing from all corners of the globe about the wonderful photograph my dad had shown to those who passed through his life. What’s interesting is that it was reasonably rare for him to tell you what he thought directly (although there were times when he would let you know exactly how he felt!). It was almost as if this form of praise was elevated when done by proxy, as if receiving it second-hand was in some way more meaningful. I suppose my greatest wonder is what would he have thought about my discovery of a creative streak, which almost went unnoticed. What would he say? This morning I sat with Valerie and my boys around me, opening cards and presents. I was quite surprised to receive an instant camera. I had been looking at the different types of these that are still available over the last few weeks. There is a photograph of me with my brother, my cousin Michael and his mum, my aunt Margaret taken on the back doorstep of my grandmother’s house. This photograph was passed around on Christmas Day a few years back. That photograph was taken on a Polaroid camera. I’m not sure who took it. I reckon that I was about 4 years old. My immediate thought on opening my new camera this morning was to that photograph taken about 37 years ago and how it captured a moment that still lives on to this day. Fathers’ Day has made me consider how all these things tie together. What I believe is that the most beautiful photographs are little treasures. Print them out and keep them safe but don’t be afraid to share them with others. Most importantly, capture those moments. It is a way of telling somebody how much you love them. Happy Fathers’ Day to all dads - to the present and the eternal. There are not enough rolls of film in all the world for me to photograph all the things that I want to. Lone trees, waterlogged fields, rows of power pylons leading off into the distant fog. I am on the Eurostar from Paris travelling through some truly beautiful French countryside, wishing the train would stop a million times so I could get out with my Hasselblad. There is a mystique about this country when it is under a veil of mist that I cannot put into words. The best I can do is to compare it to a trip back in time as so much of looks completely devoid of the signs of modern life. I see old farmhouses and country churches nestled amongst groves of trees, flat plains with distant obscure shapes silhouetted in the mist, their identities unknown to me. The wide open beauty of the countryside is in contrast to the congestion and hustle of the capital. Paris is a city that had changed since I last visited. There has been a visible increase in security on the streets and a visible increase in the number of homeless people on the avenues and boulevards of the city. This was particularly visible outside the Gare du Nord where it seemed there were teams of women and children working their way through the crowds with their hands cupped in front of them. I wonder what the solution to this is. I watched a group of these women stop and congregate for a cigarette break before they started working the crowds again. It appeared to me that this was an organised effort which coloured my view a little. Then a young girl, who appeared no older than my eldest son, approached me asking if I spoke English. Given my internal conflict at this moment I am not surprised that in Europe we seem unable to agree on how to start to solve this issue. The truth, which is never far away in my mind, is that I am (perhaps) part of the Irish diaspora, having decided to leave Ireland in 2001 to work and live elsewhere. I have been recently referred to as an immigrant which, I admit, grated a little. There was an implied suggestion in that comment that I am less worthy than a local person which I can't pretend to understand. My reaction was a useful reminder that being too judgemental can be a cause of conflict in itself. I have included here a link to Dorothea Lange's 'Migrant Mother', an iconic image that reminds me that migration and displacement of people has been around for a long time. We live in an imperfect world. Should we try to address the imperfections or should we ignore them with the view that the world will always be this way? As I leave France and we make our way under the Channel, I am left with these thoughts and not many answers. I love France but it is a country with many conflicts. Morning unveils itself like a bashful bride, slow and tender and blushing. The air is cool and still. I love this time. The world turns and awakens and breathes life into a new day. At the coast, the sea ebbs and flows. The beat of the summer tide washes onto the shore rhythmically, like the pulse of the earth, quickening and slowing. I listen as the water crashes and retreats, incessant and timeless. The warming air is a kaleidoscope of colour. The light bathes the land in golden hues. Night's purple legions are replaced by deep reds, creamy pinks and sky blue. High above my head, the clouds blanch and bloom, silent witnesses to the story of dawn. And so the day begins. The earth rotates through space turning at once toward and away from the Sun. As I watch the night slip away in a combination of colour and warmth so some are turning the lights out on their day. We are all passengers on a daily voyage. Soon I will leave for home. For the minute, I am alone and king of all that I see. I hear the call of a seabird and the engine of a distant car. My spell is broken and the day has begun. Often, but not always, I shoot long exposure photography. I listened to an interview with Alexey Titarenko today and he suggested that to shoot long exposures was to put yourself into the photograph. I like that idea. In long exposures you record something the eye cannot see - the passage of time. In doing so, you determine what the final photograph will be by deciding on the period of time during which your shutter will be open. Therefore, you put a unique element into the photograph and in some mysterious way, that unique element is a reflection of you. Alexey Titarenko is best know for his 'City of Shadows' work - city_pict1a.jpg He captured the movement of people to create a symbolic image of the transient nature of life in St Petersburg. I find this particular series to be very profound and powerful. You get a sense of the harshness of life under communism. You feel the cold and the poverty and the totalitarianism. You see beyond the photograph into the society. It is remarkable that a black and white photograph has so much colour to it and can reveal layers that are not visible on the surface. Michael Kenna talks about using exposure times of up to 7 hours to create his photographs and the luxury of having that time in which to do nothing. ba66903.jpg There is an immense beauty in much of his work but I find the extent that he is willing to push the boundaries of what he is doing to be hugely inspirational. Michael Kenna rips up the rule book in pursuit of individual creativity. He demonstrates that it is the photographer and not the camera that actually takes the photograph. Firstly, I enjoy the process of taking the photographs. During the process I often feel a sense of calm and catharsis. I sit and wait and watch time go by. I listen to the sea or the wind. I switch off. Those moments are the perfect antidote to the stresses of life. I find that my mind empties and there is a sense of peace. Quite often, I will use the time to look around the scene to see if there is another composition that I want to shoot but generally I will just wait. Secondly, I love the results. I like the idea that you leave something to chance during the process. Things happen that you cannot control; people may wander into your shot, the light may change and elements such as water and clouds will move. Generally, the effect is to smooth movement and this can help generate negative space in the final image. 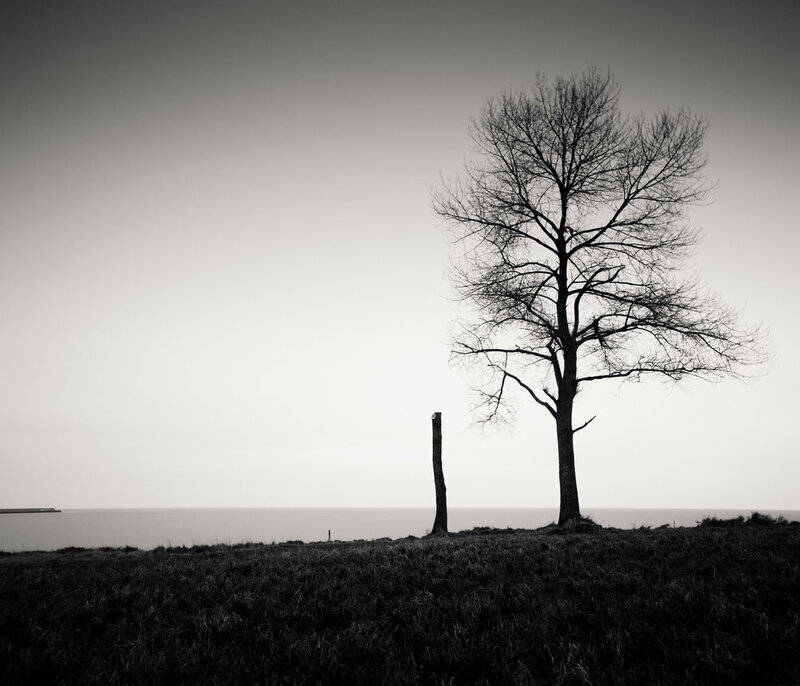 I love minimalist photography and simple images and negative space amplifies these concepts. It also creates a sense of mystery in an image and hints at what may have been there. Not all the questions are answered. You may have to draw your own conclusions. So what conclusions do I draw? Actually, I'm not sure and this is the beauty of it. Yes, I feel peace in the process and contentment in the results, but not all questions need an answer. Perhaps the creativity is the answer itself. Perhaps this is a part of my life that I don't need a definitive conclusion for. Perhaps all the answers are wrapped up in the final photograph.